Is Macedonia's EU Dream Fading? A recent “Euro-barometer” poll, published in the national media last week, caused a minor political stir in Macedonia. The poll found that support for Macedonia entering the European Union (EU) has declined by six percent compared to last year. 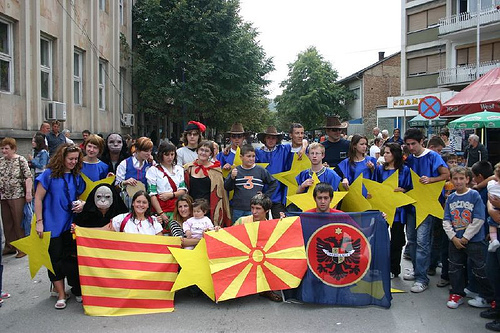 Close to two thirds, or 60 percent of Macedonian citizens, said they supported EU integration, a higher percentage than counted in most other pre-accession EU member states. But despite high support for EU integration among Macedonians, the fact that there has been a decrease in support since 2009 made the recent polling results seem disappointing and sparked political reactions from the opposition. Representatives of opposition parties blamed the declining support for joining the EU on the “euroskepticism” of the current government. “Each time [Prime Minister] Nikola Gruevski cannot solve a problem, he blames it on the EU, and this creates a euroskeptic public in the country,” said Radmila Sekerinska, member of the opposition party, the Social Democratic Alliance of Macedonia (SDSM), and president of the National Council for European Integration. Deputy Prime Minister for European Integration, Vasko Naumovski, retorted that not only is the government not euroskeptic, but on the contrary, it promotes EU-enthusiasm. Only 11 percent of those surveyed said EU membership would be bad for the country, two percent more than last year. The largest portion, 27 percent, did not have an opinion. Unemployment was the most pressing concern for Macedonian citizens, with 63 percent of respondents to the poll worried about it. A relatively small share, 24 percent, of those surveyed said they expected things, in general, to get better over the next year. Even though the strongest concern among Macedonians was unemployment, it was the decline of the support for the EU which made the headlines. This is an additional indicator of the significance attached to the issue in Macedonia. Joining the European club has, in Macedonian language, become a sort of shorthand for prosperity, even though most people lack a clear idea of how that prosperity could come about. In addition, EU accession has almost come to be understood as “the end of history”, as the happy finale to a long historic process. Alas, this overly romanticized idea has, in recent times, suffered huge blows from the cruel reality of European integration. It is possible that some of this rude awakening is only just now showing up in the Euro-barometer's poll. Macedonia has recently started to realize it could be in the waiting room forever simply because its southern neighbor Greece says so. Athens is ready to lift its veto on Skopje’s start of negotiations with the EU, but only if Macedonia accepts what most Macedonians really find difficult to imagine – changing their name and identity. This, understandably, makes many people start to wonder if it is actually worth it. “At this point in time, entry into the EU seems very distant and uncertain. I am personally very discouraged by the negotiations over the name with Greece”, says Ana, a young, unemployed linguist from Skopje. Ana says she hopes Macedonia will somehow manage to join the EU and still manage to protect its identity. She says the country should be allowed to protect its identity, the same as other countries in Europe. “I understand the advantages of joining the EU, but I would not insist on entering at any cost”, says Sreten from Tetovo, an NGO professional. Sreten says he does not expect huge changes in his life if accession happens, pointing to Romania and Bulgaria as examples. In his view, joining the EU did not bring big change to the lives of many citizens there. Professor Melina Grizo from the Law Faculty in Skopje says some of the benefits of entry are quite clear-cut, such as greater investments or enhanced political stability. Other changes could be more difficult to predict. More than certainly, many of them would, in fact, be frustrating. “It may be an exciting development to see how membership is going to influence the notoriously inefficient Macedonian judicial system”, says professor Grizo. “One wonders how the implementation on the legislation on corruption would influence Macedonian elites, who care little for these kinds of limitations,” she adds. Slavica is a young entrepreneur and a co-owner of an event planning agency from Skopje. She is hopeful that entry would improve opportunities for companies in Macedonia. “Learning to compete on the big European market would have a huge benefit for companies in the country”, she says. “The EU will be a real chance for the businesses that manage to adapt to the new conditions,” adds Slavica. She is hopeful for a quick entry, perhaps in a few (3-4) years time. Such hopes inevitably hit the wall of political reality. “Macedonia will begin negotiations only after it changes its name”, professor Grizo adds. She thinks this is unlikely to happen under the current government administration, and such a delay would further postpone the potential start of negotiations. Then, once negotiations eventually start, they typically last for several years. Sreten is less of an optimist. “I think it would be a huge success if we enter by 2018”, he says. Not long ago, the EU Ambassador to Macedonia, Erwan Fouere, said during a public lecture that Macedonia went “a step forward and two steps back in its accession process.” Fouere used the metaphor to describe the country's lack of progress with reforms. Most Macedonian citizens are probably not even sure of that little step forward. But not because of the reforms. They have been subjected to one veto after another for seemingly bizarre reasons. They desire for and dream of the EU. In the dream, happiness seems within reach, but when you try to grab it, you realize it is distant, so distant you are not sure if it is real.